It’s the week where I edit reports at the school where I work. It’s one of them new-fangled progessive schools where they don’t believe in grades and report cards — oh no, carefully crafted multi-page narratives for every child. (I think this is tremendously laudable, just so we’re clear.) The teachers write their reflections on the students’ achievements of the term, and then I brandish my red pencil to help bring them up to our director’s literary standards. Last night I brandished until I was cross-eyed, and then I decided it was a good time to take pictures of my Retro Rib socks. See? I really did finish them! You can also see here a prime example of why you should never delay casting on that second sock, my children. Look closely at the ankle region of the left sock. Ignore the fact that my feet are on the kitchen counter (it seemed like the thing to do at the time, to get them into the light) and observe that unsightly pooling. That is what happens when you allow the first sock to languish mateless for so long that you forget what size needles you used to knit it. I peered closely at that first sock and compared it to some other socks. I knew I’d made the feather-and-fan socks on #0’s, and the Pig War socks on #2’s, and that lone Retro Rib looked like it fell somewhere in between. So I cast on the second with #1’s. Alas, I got the barber-pole stripes right away. Silly me, I blamed the yarn. It is hand-painted, you know, and it was from Claudia’s early days in the business. (I just saw a new batch of this same colorway, Ingrid’s Blues, in the shop, and it was completely different: indigo midnight and chestnut. It called to me. But I was deaf and virtuous.) And then I got that really goofy separation you see on the ankle, and I figured it was a smack upside the head from the knitting gods. It wasn’t until I realized my heel flap was coming out awfully long that I became suspicious about the needles. Sigh. I switched to #0’s right away, so the feet match pretty well. As long as I wear pants, no one has to know that the left sock is an inch taller and a mile whackier. While I had the camera out, I thought I’d show you my tree. It was the middle of the night with no tripod, so why not, right? Behold our tree. 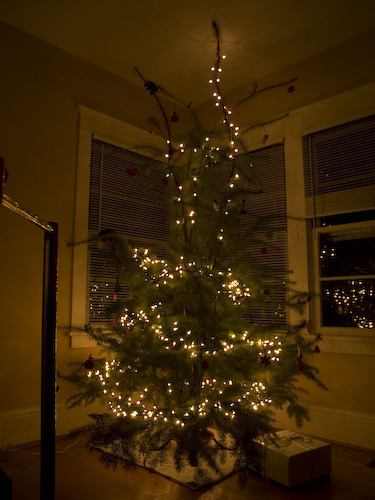 It may be the ugly duckling of all Christmas trees, but we think it has character. We like that it has three noodly appendages instead of a top (or a middle, for that matter). We cut it on my parents’ property back at Thanksgiving and tied it to the roof of the car, and the trip down the I-5 corridor left it somewhat battered. It broke one of the noodly appendages whipping about in the breeze. But we knitters don’t come by way of the turnip truck, so I scrounged up some #2 dpn’s and splinted it, as you can see on the right. (Maybe. It helps if you pretend you’ve had a snort or two of holiday nog and can’t quite focus.) 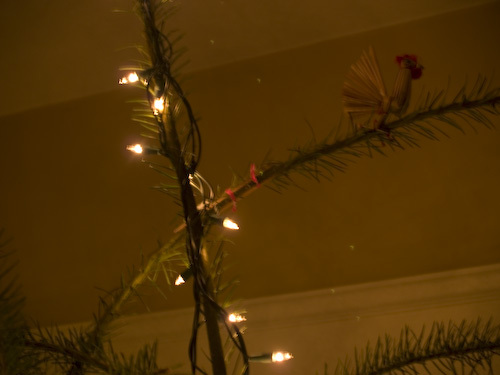 And yes, that’s a rooster on top of our tree, not an angel or a star. Vive la France. Actually, these last two pictures are rather a poignant commentary on my state of mind, since the next thing I did after taking them was to step over to the computer and buy my parents tickets to a play — one ticket on Thursday the 21st (the last remaining ticket, it turned out) and one ticket on Thursday the 28th. I had a little meltdown. Then I saw this and it raised my spirits a bit. Fortune smiled on me this morning, though. During my plaintive call to the nice lady at the box office, a second ticket for the 21st magically became available. My parents’ Christmas gift is intact, and they won’t even have to enter the mosh pit that is the stand-by queue. Feather-and-fan socks in Mountain Colors Bearfoot for me mum’s Christmas present: one complete; one tenth of second done been knat. 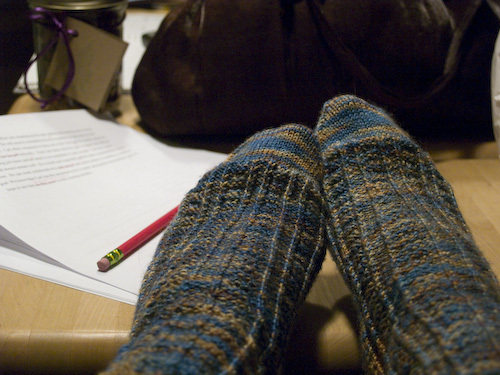 Retro rib socks in Claudia Handpainted: four inches and counting. 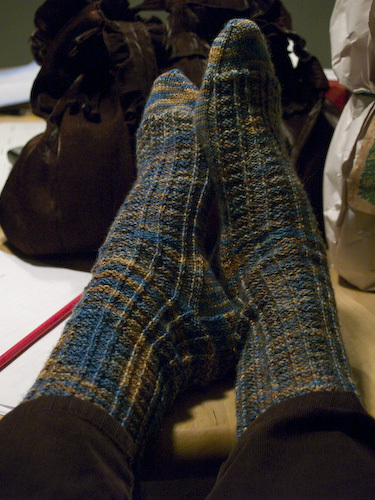 It took me a while to find a good pattern for the Claudia sock yarn. As you can see on Lisa’s page, the browns and blues want to spiral around each other like a barber pole. I had intended to make Ann Budd’s Diagonal Rib socks from Interweave, but the right-slanting diagonal rib combined with the left-spiraling stripes was pretty awful. I tried a few basic rib patterns, but I really wasn’t digging the spiral that much at all. 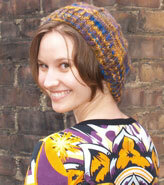 Finally, I tried Retro Rib, thinking the many purl stitches might help break up the striping. Viola! A nearly perfect blend of blue and brown. Huzzah!